Christo, (christened Hristo Yavashev, in Bulgarian Христо Явашев) is an internationally acclaimed wrapping artiste who uses fabric, paper and gift bags in his massive installations. Wrap Master Christo and his wife Supermodel Jeann-Claud stroll about the Bulgaria Capital city of Sofia. Born in 1935 to poor but honest collective parents in Bulgaria, young Hristo yearned for first name that people could pronounce and spell. To raise the $1.95 that he needed to have his name legally changed to the simpler "Christo', he took a job in Sophia Bulgaria’s famed Zerg Department Store in the gift wrapping department at the hourly rate of .001 US dollars per hour. Under the tutelage of Zerg’s master Asian gift wrapper, Sugekko Todekku, Hristo blossomed at his craft. Within months he was wrapping presents without the aid of cellophane tape by using complex origami patterns and folds. During World War II, young Hristo plied his craft on Bulgarian Army tanks which he concealed in olive, tan and burnt umber wrapping paper so well that even the Bulgarian Army lost track of the giant machines. In 1947, after Bulgaria was liberated by the Soviet Communist Party, he changed his name to “Christo” and repudiated the trappings of middleclass gift giving. He also turned in his mentor, the Asian Todekku, as spy working for Sears-Roebuck and Company of Chicago, Illinois. In 1949, Christo, now 14 years old, shocked the Communist world when he introduced the gift bag. While Christo believed that form followed function and that a bag was a wrapping of its own, his wasteful use of tissue paper was deemed too “Western”, and Stalin called for his head. Under dark of night, and using a network of fellow wrapping paper artist, he crossed over into Romania dressed as a Hay Mow, said "Che fac." and exited the coutry this time into Austria. The young man who would become an international artist was on his way, somewhere, but he wasn’t at all certain which way to turn, so he asked “what would Christ do?” and followed that example. 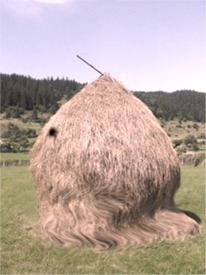 Romanian Securitate image of Christo sneaking through the Romanian countryside on his way to artistic freedom in 1948. In 1958, after a nine year gap in his life that can not be explained or documented, Christo magically appeared in a Paris bistro that was a haunt of the chronically hip art scene. It is there that he met the enchanted Jeanne-Claud, who, had just a first name comprised of two other names. Christo was intrigued, especially with this mysterious woman's shocking orange hair; he vowed to teach her all he knew about covering things up. 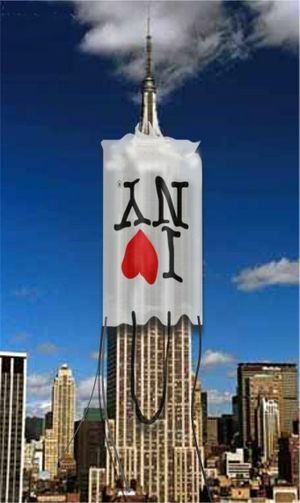 Wrap Master Christo's 2000 wrapping of the Empire State Building with a gift bag went awry when his wife Jeanne-Claud read the plans upside down. In 2000, Christo and Jeanne-Claude felt that the world was ready for a reintroduction of the Gift Bag concept that Christo designed in Bulgaria in 1948. With permission of the building’s owner, Leona Helmsley, Christo and his wife decided that they would place the the iconic structure by using an I Y NY bag. However a mix up in communications lead to the installation being set up upside down. Art critic’s along with the Sierra Club and Hallmark called the finished project daring, marketable and recyclable, and Christo claimed victory. In 2002, Christo lovingly looked at his tarnishing trophy bride Jeann-Claud and decided that is next installation would pay tribute to her. 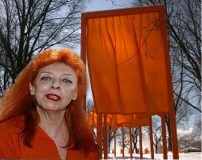 Christo announced that he planned to erect dozens of gates, supporting orange banners woven from Jeanne-Claud’s own hair in New York’s Central Park. New York City cleared it throats and said that Christo was mistaken. Christo reasserted himself. New York dug in. When the impasse grew almost as big as the pile of Jeanne-Claud’s hair, a deal was brokered by columnist Cindy Adams that would allow Christo to build his installation, not with dozens, but hundreds of gates. The artist was elated. His trophy bride (and her follicles) was not. However in the winter of 2005, the Gates opened in Central Park to universal acclaim. 1956, Christo walls off Berlin using Popsicle sticks. 1959, Christo wraps the Maginot Line and gives it to Jeanne-Claud because it amuses her. 1962, Christo turns the Leaning Tower of Pisa into a giant barber pole. 1964, Christo announces plans to wrap the Great Wall of China in red silk to piss off the Soviets; takes ten years of silk production to amass enough thread for cloth. 1967, Christo wraps Greenland in a specially knitted jumper sending global temperatures upwards. 1971, Christo covers each governmental building in San Paulo, Brazil in tea cozies. 1972, Christo called by Nixon White House and hired to cover up the Watergate complex in Washington D.C.
1973, At Jackie O’s request, Christo mounts Christina Onassis and wraps her in Saran Wrap. Project takes two years. 1974, Great Wall Project completed, Mao is overcome with Revolutionary Pride and drops dead. 1975, Christo erects a fabric maze through the middle of the Atlantic Ocean. 1981, Christo wraps the tower holding Big Ben in dental floss to protest England’s appalling lack of qualified dentists. 1990, Christo convinces the citizens of Tokyo to wear strange hats made of Aluminum foil for one month simply because it will amuse Jeann-Claude. 1992, Christo covers Australia with a giant parachute; New Zealand’s sense of self worth suffers, again. 1993, Christo wraps the Taj Mahal in a turbin; India discovers irony. 1995, Christo surrounds The Reichstag in a giant sheet; covers Malibu, California in a tarp. 1998, Christo and Jeanne-Claude attempt to protect the Petronas Towers against STDs using two giant condoms failed. 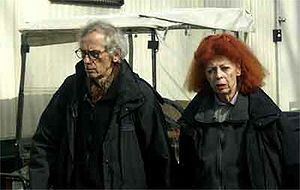 1999, Christo and Jeanne-Claude bury the remains of the Titanic under a blanket made from woven seaweed. 2003, Christo and Jean-Claude are called to New York for consult with Donald Trump. They trample Vidal Sasson winning over Trump with their comb-over solution for the vain millionaire. Following The Gates project, Jeanne-Claud was exhausted, her head really hurt. She really tried to get Christo to think small for once. Yes, he had wrapped The Reichstag, draped a giant parachute over Australia, placed a pool cover over the Adriatic Sea and even designed evening wear for Oprah. But Jeanne-Claud reasoned that he was too comfortable with his oeuvre and challenged him to search deep inside their home for something that would present a real challenge. Christo knew that she was right and that size didn’t mean everything in life. On September 30, 2005 Christo announced that he would use nano technology to weave a covering made from the lint in their dryer and envelope their pet kitten in a lint jaquard pantsuit and matching houndstooth hat. Jeanne-Claud is reported to be relieved. This page was last edited on 20 October 2015, at 21:46.